On 20 January, the new round of EU financed civil protection projects was kicked off in Brussels. Several Samaritan organisations are involved in the project INDRIX, which will assess the inclusiveness of disaster relief projects and the resulting increase in resilience for vulnerable groups. Professor Massimo Giannini of the University of Rome Tor Vergata presents the project at the official kick-off event in Brussels. 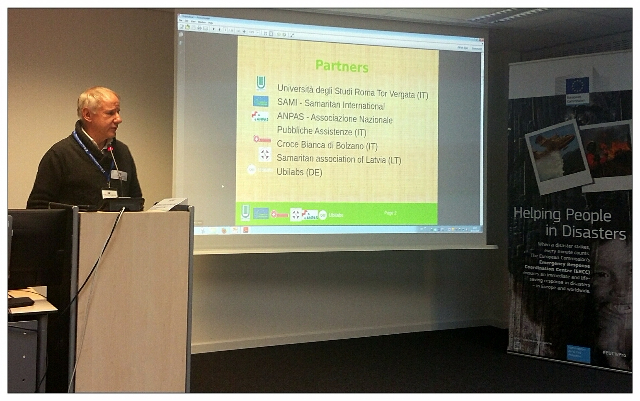 INDRIX, which is short for “Inclusive Disaster Resilience Index”, is coordinated by the University of Rome Tor Vergata. Samaritan organisations ANPAS, LSA and WK, together with the SAM.I. network, will contribute their expertise to the project. As a technical partner to develop visualisation and mapping tools, the project relies on the company Ubilabs from Hamburg. INDRIX is the third consecutive civil protection project with Samaritan involvement, after SAMETS and ADAPT, that has been chosen for co-financing by the European Commission. In recent years, many disaster prevention projects focus on increasing the resilience of the general populace as well as of people particularly vulnerable in case of disaster. Such vulnerable groups include, for example, the elderly and people with disabilities. INDRIX will assess the impact of the pre-existing projects and initiatives by mapping them according to several criteria of what contributes to resilience. These criteria will be defined in a collaboration of social scientists, the participating Samaritan organisations and, most importantly, stakeholders and organisations involved in support for the target group. A social resilience index will be created out of these criteria, which will allow self-assessment of stakeholders and their projects and initiatives. Also, the analysis and visualisation of the projects will allow the identification of gaps in inclusiveness that still exist in modern civil protection and disaster relief process chains. Work on the project will be kicked off at the first steering group meeting, which is scheduled to take place in February in Rome.